I will start by quoting a fellow audience member at the completion of The Rover at a screening yesterday: “I just lost two hours of my life.” And now I want to state emphatically: I couldn’t disagree more. The Rover doesn’t give the viewer a lot up front. If you don’t read about it on the official website, or any forums (or other film related websites such as this one), you’ll have even less to work with. Go into it blind like I did, and you’re on your own trying to figure out if there is anything going on here or if is just an excuse to film some desolate people in desolate places doing, well, not a whole lot. But pay attention, look and listen and, heaven forbid, put an ounce of thought into what you’re seeing and hearing, and the clues will fall into place. This is not a spoiler post and I’m not going to discuss in great detail what the film entails, but I want you to view this film. I have no personal stake in the success or failure of this film or anyone involved in making it, but the film has left such an impression on me I feel the need to share this and hopefully encourage at least a few persons to look past some ignorant reviews out there in internet-land and give this film a chance. Immediately at the completion of the film, I wasn’t sure just how I felt about it. As it twisted and swirled around in my head just beneath the surface I began to realize just what I had seen and just how beautiful it all was (if you can dig that stark kind of desolate beauty, and I’m not just talking about the landscape). It’s a little bit funny, and (more than) a little bit sad. 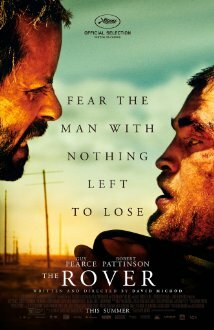 It’s a film that doesn’t spoon feed the audience and doesn’t follow a lot of “normal”, so if you’re looking for something a little more rewarding than CGI explosions this summer, give The Rover a chance.